Glamping the Fourth in Marfa, TX — THE FAUX FANCY. The stars at night are big and bright (clap clap clap clap). No, really, they. are. in. sane. My friend and I decided back in March to scratch a mutual item off our bucket list and make our way to Marfa for the weekend. Who knew a 45-minute plane ride plus a 200 mile car ride would land you in one of the most beautiful, remote, yet serene places I've ever experienced? I had to keep reminding myself I was still in Texas. 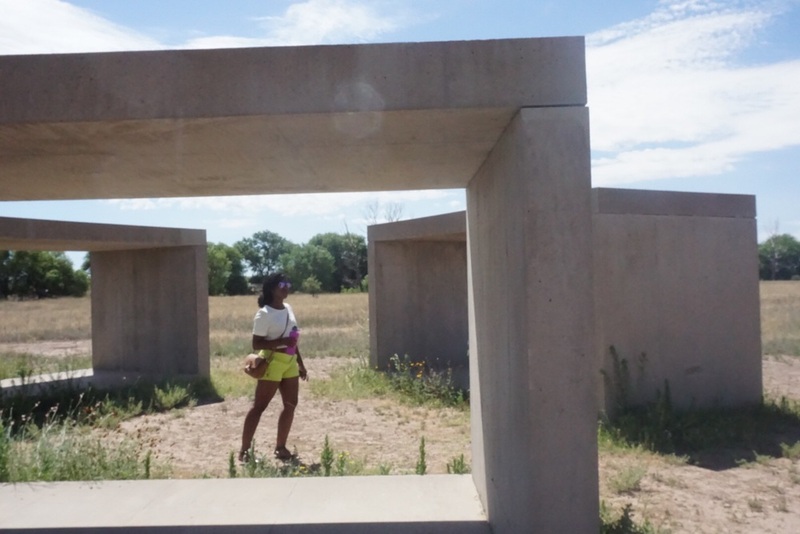 For those of you who have been living under a rock, or somehow have not come across this magic on the internets (I mean, come on, Beyonce has been there), Marfa, TX is a itty bitty town in far West Texas with a booming population of about 2,000. The town itself is about 1.5 square miles around, and if you blink, you might miss it. It's popularity is due in part to the minimalist American artist, Donald Judd, who moved to Marfa in 1971 from New York City and permanently installed his large-scale art. Modern artist soon followed suit to live and create in Marfa. It's an art mecca. In the middle of the dessert. We flew into Midland with the intention of stopping at the Monahans Sandhills State Park. When I tell you it was worth it, I tell you no lies. Herein rests this 3,000+ acre park full of sand dunes. Beautiful, white sand for as far as the eye can see. It's ridiculous. We stopped for about 30 minutes on Friday as its en route to Marfa. We were the only people in sight. It was so peacefully quiet. I felt so close to God. We arrived to Marfa a little after 4pm and checked into our hotel...er... teepee which was high key the coolest thing ever. It was actually the reason we booked. Back in March, I saw that one of the three teepees at El Cosmico was available Fourth of July weekend and... sold. They are usually booked many months in advance, so we jumped on the first opportunity. El Cosmico is basically a campsite/"hotel" situation featuring 3 teepees, a yurt, numerous pimped out airstreams, 20 or so safari tents (with beds) and open land for you to pitch your own tent. Our teepee was the cutest thing ever. And aside from the ant infestation (yall, it was bad), it was super comfortable. Saturday, we made the 2.5 hour drive to Big Bend. Let me tell you, aside from a couple of cool photos, I had zero idea what I was getting myself into. The drive to Big Bend is... scenic, sure. But, deserted. There's literally nothing but a few ranches miles apart for most of the drive. You soon realize you're driving into the mountains, as they close in on you from both sides. About an hour in, I started having panic attacks. The thought of running out of gas, with no phone reception, in the middle of literal nowhere, ate me alive. I took about 50 deep breaths in a 5 minute stretch. I had never felt so overpowered by nature, it was intense. When we finally got there, we checked in at the gate, paid our entry fee, and accepted a map from the park ranger. 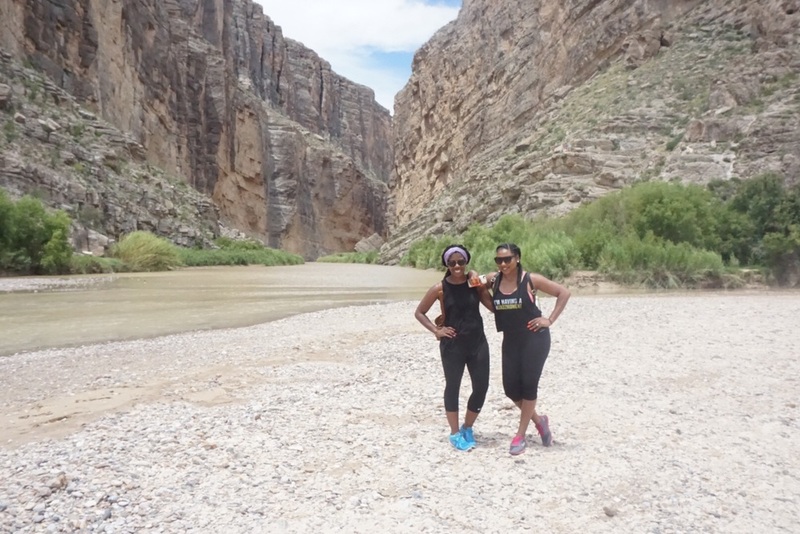 We knew we wanted to get to Santa Elena Canyon, but had no idea how treacherous it would be to do so. Once inside, you can be driving more than 30 miles before you reach anything (we had no idea) -- to say that park is massive is an understatement. We were about 30 minutes into the drive to Santa Elena when it started. The biggest panic attack I've ever had. We were driving on mountain's edge and I had to close my eyes a couple of times. Then, we see a warning sign for an incline we were approaching. All I remember is a triangle to resemble a mountain and a truck pictured seemingly falling down said mountain and I lost it. I covered my face with the map and started hyperventilating. Soon after, tears followed. Thank GOD, Lesley had a hold on her emotions, because... I was a disaster. She also felt uncomfortable, and instead of panicking, made a three-point turn and got us TF out of there. We stopped along the way to get out and take some pictures. Getting out of the car helped a lot. I felt more in control. Once the nerves calmed, we decided to try another route to Santa Elena. This time, an unpaved road. There are warnings at the entrance to be sure you have gas and four-wheel drive - we had both, so we put-putted our Dodge Charger through the rocky terrain. We almost turned around 3 times only 3 miles in. The rocks were intense and about 5 large ones hit the underbelly of the car making both of us nervous. Long story long, we finally saw another car... well, Jeep and we talked to them about our concern getting through the drive. They agreed to go ahead of us and if there were a creek or portion we couldn't cross, they would stop and let us know. It wasn't long before we got to one there was no way we could cross, and they offered us a ride. What angels. I'm so glad we didn't miss out on this experience, because Santa Elena is a beaut. The rest of the time we had left, we dedicated to Marfa-ing. We ate a lot, we drank a lot, we Prada Marfa'd, we met new friends. I'd definitely go again (with a few alterations) 10x. Here are some outtakes from our trip.